I was really holding out hope to complete the film reenactment trifecta of "Shawshank Redemption" "Into The Wild" and finally "Cider House Rules. I thought it was going to happen when the guitarist from the Ceilidh told me that a farm down the road was hiring bean pickers. Yes! I would get to work with Jamaicans and learn the hard facts of life...just like Tobey Mcguire's character in Cider House Rules. What a triumph that would be. To recap: I spent a winter in a decrepit boarding house in New England where the remains of cement workers and junkies and depressed ex-cons go to die. Oh, what fun I had feeling sorry for myself. I look back on those days with real nostalgia, drinking Pabst Blue Ribbon and playing penny poker of a three card variety. Getting drunk and falling up the stairs, going to the local bar and dancing with the divorced sheet metal workers and medical product assemblers. I didn't go so far as tie a rope around an exposed rafter only because there were no exposed rafters. My room looked out over the frozen river. 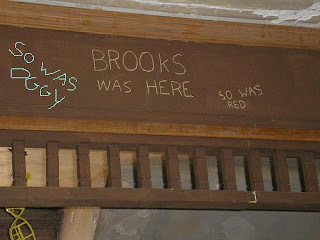 I had become Brooks minus the long years in jail. The lessons from that experience are still percolating in my brewery as the black goat of my demise climbs the crooked staircase to the narrow precipice of self-loathing. Raise your hand if you ever lived with a terminally diabetic balloon magician. I escaped the Laconia boarding house and cream always rises to the top, so they say, and I found some work in the semiconductor field, which was boring as hell and taught me nothing. As for the Into The Wild story, I have been cursed by not only a physical likeness to a Christopher McCandless (wiry, bearded, athletic) and a temperamental, reclusive, anti-social, misanthropic, resentful side that he had around some people (family) and an effervescent, spontaneous, devil-may-care, come-what-may, life is an adventure attitude around other people (indifferent strangers) BUT I also went to Fairbanks, Alaska in 1989 with the official goal to take classes at the university but really I wanted to homestead and pan gold. I failed in this goal that year because of circumstances that will be investigated upon my death, but returned in the late summer of 1992* after convincing myself (during a transcontinental bicycle trip) that I had ghosts or "demons" to vanquish by completing a pilgrimage to Fairbanks. That happened to be the same year that McCandless had decided to hitchhike to Alaska to live off the land in Denali National Park. On the trip to Fairbanks (I hitchhiked too) I was involved in adventures too numerous to name, the two major ones being (in abridged form) picked up by a drunk Innu Indian and his beaten English wife as we swerved through British Colombia to an Indian reservation where we went to a cowboy bar and subsequently insulted (or were insulted) to the point that we left, the Indian broke into a house as I drunkenly allowed him to stand on my shoulders crashing through a broken window into the kitchen to steal various effects that he said "Belonged to him" and then racing away with me driving with one eye closed and all his belongings in a trailer that bounced and clunked down the dusty Alaskan Highway into the dim light of the Northern Night. Then followed a showdown between he and I as his verbal abuse of his wife had become intolerable. He wielded a stolen double bladed axe and stared at me. "Get in the car and drive!" he yelled. My hands were shaking. I was torn up in ways that still cripple me today, my groin tendons were torn, my collarbones were separated, my shoulders were separated. I couldn't stand up straight. I had already paid him gas money and now I couldn't continue to drive. The stars shone their indifference as coyotes and bears wandered the thick woods and mosquitoes buzzed in the air so thick that sometimes you could only see outlines of another person. That evening I could see his hateful native eyes as perfectly as a sepia toned photograph of Geronimo. I can especially recall the grease around his mouth from the moose jerky he had been stuffing in his face for an hour. I believe the very next ride I got was with a man who subsequently drove off a T intersection (as I and a British hitchhiker screamed for him to stop) into a ditch, hopelessly injuring my back and getting the truck totally stuck. The driver robbed several houses and then stole a car with the keys he'd found in a house. The British guy (a busker who played in front of liquor stores for change) went for help while I tried to wave down cars (to escape). A posse was formed, the driver was hunted down after he drove the car into a swamp and captured and locked in a bathroom. He escaped through a window and broke his ankle and was hunted down again. I fled before the law arrived. So, when I arrived in Fairbanks in July 1992, I could not walk up a flight of stairs or tie my shoes let alone go to the wild like McCandless. I did meet a kid who had claimed to have canoed down the Yukon river killing small game (and eating his dog) and was working at a Sizzler to make money for his next adventure. Together we would sneak into the tallest office building in Fairbanks and take the elevator to the top floor and then sneak through the emergency exit to the roof where we could look south where, even though it was several hundred miles away, Mt. McKinley rose above the tundra. We both wanted to go and live off the land but, as I limped back to the rescue mission, I knew it is easier said than done. The demon's amplified laughter howled in my ears. I found work as a retail inventory clerk around the time McCandless was starving to death. Ever since that time the number one comment I get, no matter where in the world I am, is "Have you read that book about that guy who died in a bus in Alaska? What was his name?" So I have had more opportunities than usual to ponder the similarities. There is no award for reenacting parts from all these movies but there is a quiet satisfaction in delving deeper into the stories than your casual fan. For instance, I don't think anyone I've talked to about McCandless knows what his deal was. Everyone wants to have an opinion because everyone is assholes but no one has done any of the dirty research and experimentation that would crack the mystery. Missing from the movie and from the book is what was obviously a desire to "start over" to wipe the slate clean. To start from scratch. Start what from scratch, you ask. Start everything from scratch. Why would he want to start everything over from scratch? Because it is all hopelessly fucked up. That rationalization and that alone will land a college graduate in the middle of nowhere with a bag of rice, a rifle and some clothes as he purposefully covers his tracks. The new world will begin HERE and that's where he camps. Anyway, that's the kind of analysis you have when you actually hitchhike to Alaska opposed to when you read about someone hithhiking to Alaska. Which brings us to Cider House Rules, the last movie in the trifecta. So, what would picking apples teach me? I don't know, but I wanted to find out and the way to find out is not to watch Cider House Rules or read the book. The way to find out is to go to Nova Scotia, find a farm where Jamaican men pick beans and trim cabbage, get a job where you feed bunnies and give chickens clean shavings and give the alpaca a bit of carrot, work from sunrise to sunset with the Jamaicans, smoke their weed, listen to their jokes, offend them and apologize and embrace the farm life whether it kills you or doesn't. Then you will have your own analysis of Cider House Rules. But thus far I have been denied. This perfect hat trick of film roles may not be my destiny to fulfill. I would like to feed the guinea pigs and goats but they do not need me to pick beans. Furthermore, the big operations can not pay cash because they only operate through the bank and the small operations already have enough cash workers. This farm in Nova Scotia was beautiful, fresh air, clean water, rich vegetables. There is a place that is not hopelessly fucked up and this is it. I don't have to start everything over but it does take work to find a place where Disney's poison has not penetrated and mice are vermin and ducks DON'T SMOKE CIGARS! *My memory was off by 1 year. I bicycled and then hitchhiked to Alaska in 1993, right around the time the McCandless story was becoming known. In 1992 I was a Merchant Marine.